"Visiting Lagos after many years away, Teju Cole's unnamed narrator rediscovers his hometown as both a foreigner and a local. A young writer uncertain of what he wants to say, the man moves through tableaus of life in one of the most dynamic cities in the world: he hears the muezzin's call to prayer in the early morning light, and listens to John Coltrane during the late afternoon heat. He witnesses teenagers diligently perpetrating e-mail frauds from internet cafes, longs after a woman reading Michael Ondaatje on a public bus, and visits the impoverished National Museum. Along the way, he reconnects with old school friends and his family, who force him to ask himself profound questions of personal and national history. Over long, wandering days, the narrator compares present-day Lagos to the Lagos of his memory, and in doing so reveals changes that have taken place in himself. 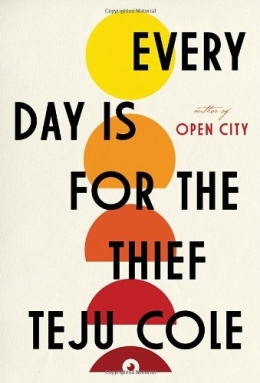 Just as Open City uses New York to reveal layers of the narrator's soul, in Every Day is for the Thief the complex, beautiful, generous, and corrupt city of Lagos exposes truths about our protagonist, and ourselves"-- Provided by publisher. Nigerians -- New York (State) -- New York -- Fiction. Homecoming -- Nigeria -- Lagos -- Fiction. Reunions -- Nigeria -- Lagos -- Fiction.